At Frigidaire HVAC we make home comfort control easy. From our high-efficiency air conditioners to our smart thermostats, Frigidaire heating and air conditioning makes taking control of your home comfort easy. We supply all you need to stay cool during the summer, cozy during the winter and comfortable at every temperature in between. We allow for ultimate peace of mind with our long parts warranty and thorough manufacturing process. Frigidaire has been designed to help families make the most of their time and space with high-performing, easy-to-use appliances with time-saving features. In 1916, the Guardian Frigerator Company was organized to manufacture early versions of the electric refrigerator. General Motors saw the potential of this company and purchased it in 1918, renaming the company Frigidaire. Since then, the company has launched the first color-matched appliances, the first home chest freezer, the first automatic ice dispenser and the first built-in, automatic lint removal system on a washing machine. Frigidaire heating and cooling products are manufactured by Nortek Global HVAC, a company that has played a significant role in the home comfort market since 1919 – starting off with the first oil burners for residential heating equipment, delving into the manufactured housing market and excelling the residential heating and cooling market. 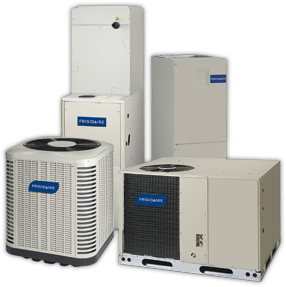 While most manufacturers test their products at random, we test each and every furnace and air conditioner we manufacture. In fact, each product goes through our “check, check and recheck” process at each stage of the manufacturing process. This process, known as Demand Flow Technology or “DFT,” means that each split-system air conditioner and heat pump is checked 144 times, each gas furnace is checked 234 times and each packaged unit is checked 72 times during the manufacturing process. In addition, our quality control station performs 100% computer automated testing to eliminate human error in the final analysis of the product. We were the first heating and air conditioning manufacturer to become DFT certified. Finding a quality contractor is one of the most important parts of the heating and air conditioning purchasing process. That is why we’ve made it easy to find a contractor who has the qualifications you need with our contractor locator. Simply enter your zip code and get connected with a contractor who is qualified to install a Frigidaire HVAC system. Our commitment to quality is reflected in our long parts warranty. 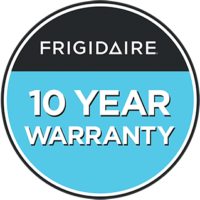 When your properly-matched Frigidaire HVAC equipment is registered, it can qualify for our 10-Year Long Parts Warranty and Comfort Quality Pledge. Registration must occur within 60 days of installation or occupancy. This warranty only covers the cost of parts. If you are looking for a labor warranty plan, talk to your contractor.